Undisputed king of the personal video camera market, GoPro Inc (NASDAQ:GPRO) CEO Nick Woodman announced at this week’s Code Conference that GPRO will be expanding with two exciting new projects: drone cameras and virtual reality. Woodman remained tight-lipped about the GoPro drone specifics, except to say that the quadcopter is expected to be available in the first half of next year and is being designed for consumers, not businesses. 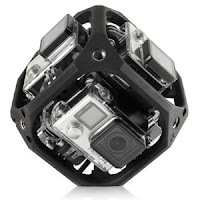 Additionally, GPRO is apparently working with existing quadcopter manufacturers to develop a type of universal rig that could accommodate existing GoPro cameras, which could then be mounted on any number of drones. Apart from the GoPro drone project, Woodman described the Six-Camera Spherical Array, which is a cube-shaped mounting rig for, you guessed it, six GoPro Hero4 cameras. The idea is that video shot by all six cameras simultaneously can be stitched together to create a virtual reality environment. With expertise and resources from Kolor, the French video software company that GPRO acquired a month ago, GoPro has an opportunity to reign supreme in the virtual reality arena. If the future of technology is indeed heavily comprised of virtual reality interactions, which many experts have predicted, there will be an overwhelming need for fresh new content. Having securely established its position as the household name in mountable camera technology, GoPro’s foray into helping create virtual reality worlds is a perfect step forward. While other tech industry behemoths such as Google Inc (NASDAQ:GOOGL, NASDAQ:GOOG), Facebook Inc (NASDAQ:FB) and Samsung Elect Ltd (OTCMKTS:SSNLF) continue in the cutthroat race to develop the best virtual reality headset, GPRO can avoid being in the line of fire. Even better — the virtual reality worlds GPRO cameras create can be easily viewed even without a specialized headset; the Kolor app, as well as YouTube 360, lets smartphone and tablet users step inside these digital environments, and even desktop web browsers can display the content. Catering to the thrill-seeking sports enthusiasts, the GoPro drone has unlimited potential. Put a quadcopter paired with GPRO cameras in the right hands, and you’ll have some truly outstanding video. Similarly, a GoPro drone would offer a plethora of possibilities for virtual reality games and tours and could even be extended to police and military applications. Woodman has, again, demonstrated an ability to recognize a gap in the existing video marketplace. Remaining true to form, GPRO shareholders can expect even more gains over the next few years and likely even longer term. GoPro has built a reputation as the go-to company for sports-related personal video equipment. Soon, that reputation will include some of the best virtual reality environments and quadcopter-filmed experiences as well.